When I was out buying fabric for years and years and years, I would find something I liked and not knowing what I was planning to do with it, simply grab as much as I could get; “Gimme the whole bolt” was not uncommon. That left me with plenty of ungainly piles and boxes of fabric cuts that didn’t have a certain future–storage nightmare. Since then, I’ve tried to be a bit more strategic in my purchases, and to have a better idea of what exactly I have on hand. Losing a ton of hoarded fabric in the flood last September winnowed a lot of my larger pieces (like the huge box of fabulous wools and wool blends that didn’t survive–sniff! ), and I’m trying so hard to learn to organize my fabrics in a way that lets me see them, use them, and wear or display them rather than just hoarding forever (and regretting that I never sewed them up once they’re all ruined in flood-y waters). Because so much of my fabric was in larger pieces of 3+ yards, I had to back up and reconsider where and in what to store what I have. I also realized I had tons of smaller cuts, remnants that weren’t all that tiny, true scraps of really fabulous fabric I wasn’t willing to toss out, and some precuts I hadn’t gotten around to using yet. I’ve skimmed so many articles about sorting fabrics according to size that it seemed like an idea I needed to investigate–my theory is, if I have a project and know I only need a tiny bit, I’m more likely to use something really yummy on it that can’t be used anywhere else. Like, a small bag that needs just a scrap for the front pocket–perfect place to showcase an amazing Japanese import print. Or a baby bootie project (like the one in Anna Maria’s new book–yum!) that only takes the tiniest bits–I suspect I’d be more likely to really tackle it if I have a pile of fabrics to choose from that are already cut to the right size. If you’re not coming at sewing from a quilting background, some of the terms used to describe cuts of fabric could be new to you. Outside of remnants and scraps, and the larger pieces that I usually call “continuous yardage,” the most common cuts are full yards, half yards, and fat quarters. If you’re not buying fabric specifically for a project, which is to say, if you’re not going to the cutting table and asking for a certain number of yards because that’s what’s called for on the pattern envelope, you probably buy a yard or a half yard. Sometimes all you want is just a taste of that fabric, and a yard is plenty to do the trick. 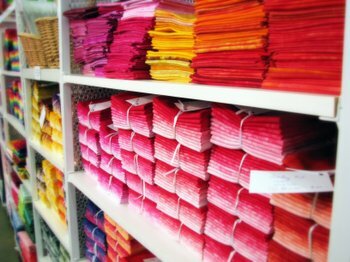 If you’re purchasing a standard cotton, you’ll end up with 36″ by 45″ of fabric from a full yard; a half yard is half that, so 18″ by 45″. The quarter yards get a little squidgier: if you ask for a quarter yard, most shops will give you what’s known as a “skinny” quarter: 9″ by 45″. Depending on your project, though, that dimension might not give you enough room to lay out your pattern pieces, or might not show enough of the design repeat to make it worth your while to purchase it. 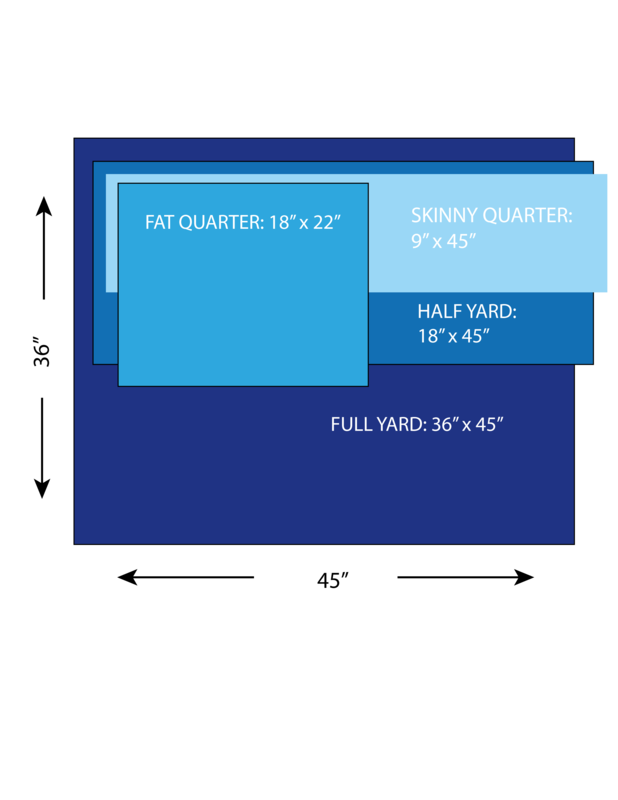 Quilters often use–and have passed on to the rest of us–what’s known as a “fat” quarter: rather than a quarter yard, a fat quarter is a half of a half yard. It’s the same number of square inches total as a skinny quarter, but in another dimension, making it easier to use for lots of different projects. So when exploring organizing fabric based on what size each piece is, there was no way I could avoid looking at stashes that had their fat quarters and half yards all tidily put away–or on display. One of the things that has drawn me to fat quarter cuts over the years is that it gives me a way to expand the number of selections I have on hand, without significantly expanding the sheer volume of fabric in my stash. If I just want a taste, a tiny piece of fabric, and especially if that fabric is more expensive than some others, I can easily pick up a fat quarter, know that I’ll have just enough to create something truly special or add just the right detail, and neither break my budget nor overload my shelves. 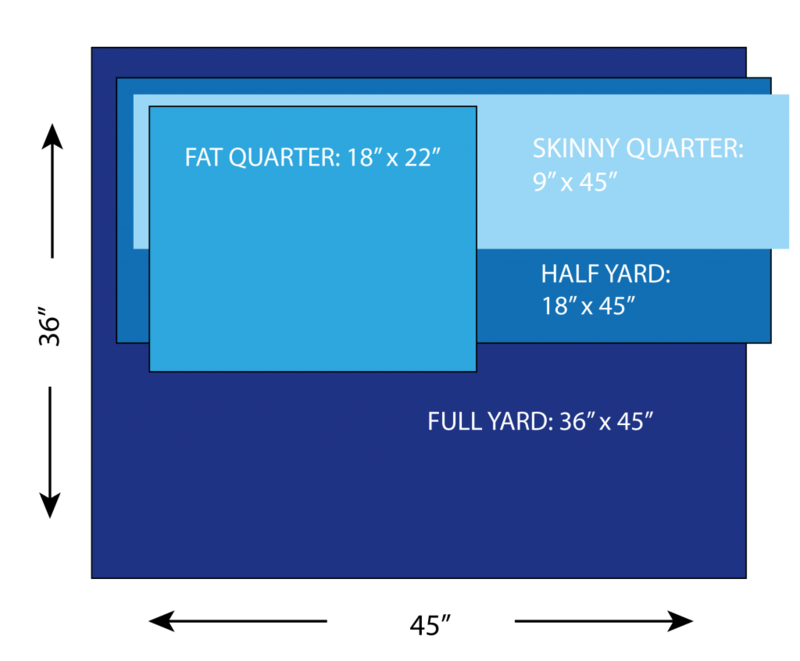 Regardless of the size of cut–fat quarter, half yard, full yard, remnant, whathaveyou–organizing based on size allows you to play a little more while in the planning stages. Put fabric together by collection? Check. 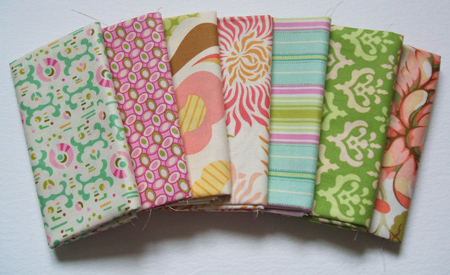 Put fabric together based on coordinating prints and color palettes? Check. I’m thinking that this way, you’d open yourself up to mixes and matches that either you wouldn’t think of otherwise, or that might not be apparent initially–leading to some really exciting combinations for your projects down the road. On the whole, I’m not sure which of these stash organization systems appeals to me the most: by color, by fabric type, or by size. I’m looking at each and thinking that combining the best aspects of each might make for the perfect system, one that will let me work through some of the really amazing fabrics I have on hand and showcase them in beautiful projects that get seen rather than stored. Our baby is due Any Second Now, so I’m nesting it up like crazy–I’ll let you know what system presents itself and makes me feel all tingly with happy inside. In the meantime, maybe you want to take an inventory of your own stash? 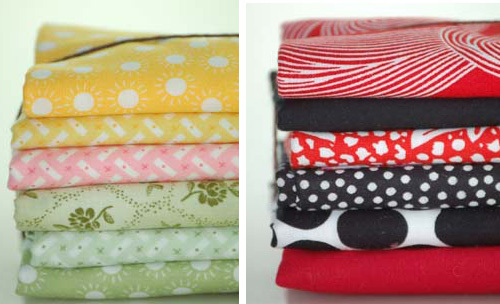 Why not head over to the Stash Busting page of our 2010 Sewing Goals and download the organizer! I don’t think I’ve ever purchased a whole bolt of anything…too gutsy for me! And did they really get ruined by flooding? Big bummer!! PS Love the new look of the blog here, very snazzy! You MUST be nesting! I’m an ATL resident and heard about your new shop from a friend. I just found your blog tonight and I love this post! I’ve been dying to find a way to organize the fabric I’ve been accumulating and I think this is really gonna help me out. I just wanted to say I sympathize with your flood loss because my whole house went under – fortunately I had the forethought to take my Bernina with us when we evac’ed!! But my fabric, all tools and my serger took a swim! I just found your site. I’m scheduled to drive one hour from my home tomorrow to donate 20+ bags of fabric to the Linus foundation, which makes quilts and blankets for hospitalized children, those in need, etc. I decided this AM that I just couldn’t part with my “roving” in case I might want to do some needle felting. I pulled this out of the trunk of my car and thought, I’ll just look through these other bags and see if there’s anything I don’t want to get rid of. Well, unbelievably, I just started crying and couldn’t stop; I don’t want to get rid of my beautiful fabrics that I’ve been collecting for over 45 yrs. I had it all ready to go, and now I’ve got half of it back in the house. Please, talk to me. Say something to me that will make me see that this just isn’t normal. You may like to check out the website http://www.seamedup.com where you can keep track of your stash, patterns, books, etc as well as assign them to the different projects you are working on!